Many years ago my mother-in-law let me look at her old family photos and other items. That was when I found a delicate and still fairly white, folded piece of paper. I opened it and was fascinated with what I read. 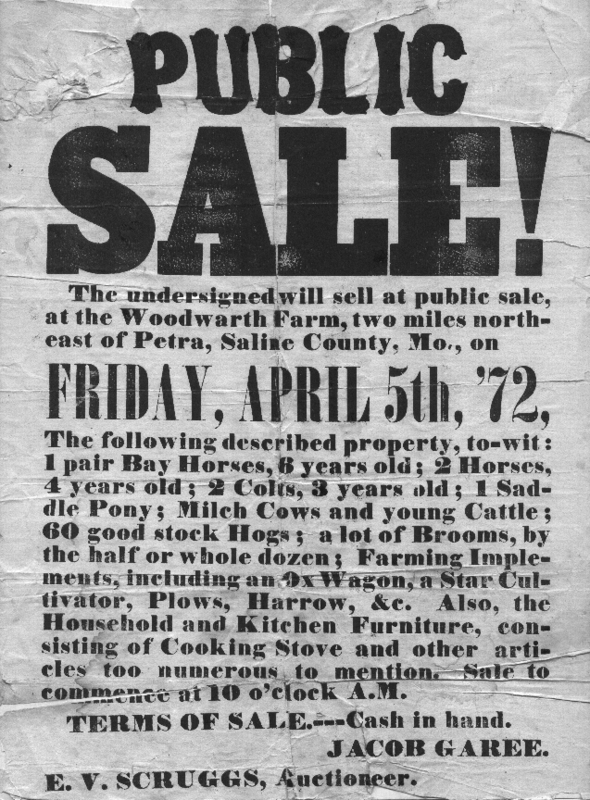 As you can see this was a sale that was being advertised to occur on April 5, 1872. Jacob Garee is my husband’s great, great, great grandfather and he and his family moved from Pennsylvania to Ohio then to Missouri. They moved to Ohio sometime between 1836 & 1838. In 1840 in Trumbull County, Ohio there is a Jacob with a female of similar age with 1 male under 5 & 2 females under 5 years of age. In 1850 Jacob, his wife and 7 children were living in Trumbull County, Ohio. Two of those children were not names handed down in family tradition, which makes me wonder if they died or if they were someone else’s children. Sometime around 1869 they moved to Missouri. The 1870 census lists Jacob, and 2 of his daughters living together. It seems that Eliza died sometime before 1866 (since she was listed in the Kansas state census that year). I have a note in my database that indicates that in 1871 Jacob was living with his son Francis in Kansas but my note is not very clear so I don’t know about the reliability of the information. C.E. Garee, Jacob’s grandson, years later wrote about his life and offers some family history that may help solve some of the reasons for the poster and other family details. You can read his interesting stories at My Tree House. I have not found Jacob or Eliza in the 1860 census yet, which will help me pinpoint a bit more such as when and where Eliza died. I’m not sure when or where Jacob died either. Some of Jacob & Eliza’s children remained in Ohio, some moved to Kansas and one moved to Oklahoma. Tonight I discovered the death record for Jacob’s oldest son, John T., and it provides new information to me. Specifically, it lists where in Pennsylvania John was born as well as his mother’s maiden name. The only problem is that I can’t clearly read them or match them up yet. Here’s the record I found, maybe someone can help me? Suggestions are always appreciated. Update: John T Garee’s mother’s last name was Lynn. Based on the information that has been passed down through John’s family, the belief is that was her maiden name. I studied Eliza’s last name a bit and thought to take a look at the 1840 Trumbull Co OH census to see who was living near Jacob Garee that might have a name that closely resembles the last name written after Eliza in the Mother column. I think I might’ve found something for you! There is a John LYNN listed in the 1840 Trumbull County OH census four households down from a “Jacob Garee” who has a son under the age of five. This fits John’s listed birthdate of 12 Jan 1836. This John LYnn has neither a daughter or son listed under the age of five but does have other children of 5-under 10, making him a possible candidate to have a future child on the way that could be Eliza, John Garee’s eventual wife. And interestingly enough, there is another man named “Jacob Gary” listed one household down from John LYNN. This Jacob also has a son under the age of five! Either one of these men could be your Jacob. I think Eliza’s name does seem to read LYNN. A rather loopy “L” that looks somewhat like an S, but I think the double “nn” at the end might be the clincher. It mentions that some of the Garee family stayed in Fayette Co., PA, which is in Western PA — a location that Ed Garee mentions in his recollections. Looks like some of the Garees also were in neighboring Somerset Co., PA.
I’ve tried to decipher the name of the place in PA on the death certificate but have met with only partial success. The problem is that the capital P in the word “PENN” below it makes it look like the third letter is a “y” but I believe it is an “N” — making the first three letters either LAN or SAN. My job requires me to know the state of PA very well and I have available many resources for the state that I have consulted. I haven’t yet found any very good matches for the letters I can deciper. However, my resources are current ones. The town or township or place that is mentioned on the death certificate could no longer exist. I hope I’ve helped a bit. Good luck. I love your blog! Cool! Thank you for the suggestions. Are you researching someone in the Garee line or what sparked your interest? I’ll be sure to visit your blog more in depth this weekend. I appreciate, very much, the ideas and help. 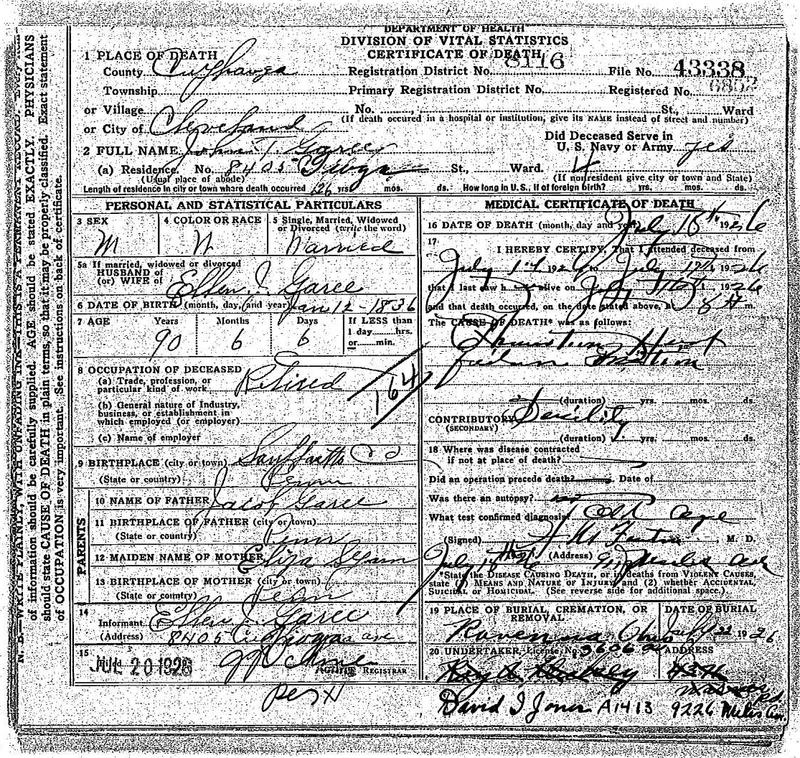 The death certificate itself is what really sparked my interest. I saw a challenge that piqued my curiosity when I saw how difficult a time you were having deciphering the words. I know from painful firsthand experience how frustrating it is to have the knowledge be soooo close and right in front of you, if you could only figure out a way to make some sense of the chicken scrawls! I figured a new set of eyes staring at the problem might be a great help. Thanks also for stopping by my blog. I enjoy yours and I certainly hope that what little I did was helpful!